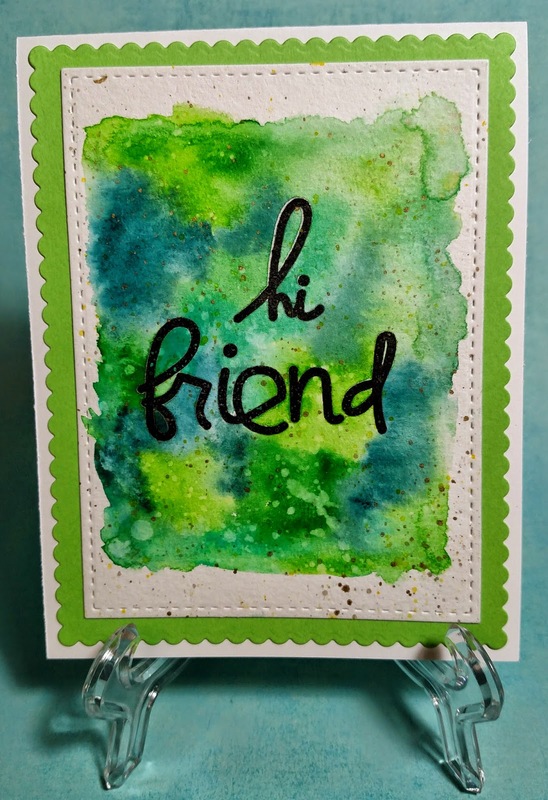 K's Kraftology: Fun with watercolors! No challenges to be completed this time! I just wanted to do something bright and fun for a dear friend of mine. He's going throught a bit of a rough patch and I thought a bright card would cheer him up a little. I had a fairly simply plan. I started with a larger piece of watercolor cardstock. 4"x 5 1/4". I used clean water and made the shape of a rectangle on the paper. I then went to my Kuretaki Gansai watercolors and picked up various shades of greens and blues. I just touched my brush to the wet paper in random spots until I felt I had good coverage. I dried it with my heat tool and then tapped on clean water. Let it sit for a little bit and dabbed it off. Last I made splatters with one of the yellows in the paint set and the gold. Sentiment was stamped in Versafine with clear embossing powder over it. Stamps are from Paper Smooches--Bold Buzzwords. The frame dies are from Mama Elephant. I believe the green paper is an oldie from Stampin Up--Green Galore.